A Note From Coach Mac! Hope everyone is off to a great start to the new semester. It is so great to see everyone back on campus again. One of the BEST things about Spring semester is Creighton Men’s basketball. The season is in full swing, and our boys are taking on the other MVC teams in hopes to make it to the MVC Championship again. So, my fellow Bluejay Crazies, I want to forward an email that Coach McDermott sent me in hopes to keep up that electric atmosphere down at the CenturyLink center. With an awesome student section, playing at “home” proves to give our team an advantage over the competition. So keep showing up, wear BLUE, and be LOUD!!! “The student section at every college sporting event is something that creates an incredible experience, as well as the atmosphere and energy in the building. When we walk out of the tunnel and onto the court, one of the first things we notice is the excitement in the building, one that is always dictated by our awesome student section. Having coached in the college ranks for over 20 years, I can look back on several occasions where the crowd’s involvement has shaped and influenced the outcome of the game. From the roar of the crowd after a dunk, made 3-pointer, or diving on a loose ball, one thing is for sure, the crowd at the CenturyLink has and will continue to impact the way that we play! Having played and coached in hundreds of gyms and arenas around the country, there are few places as special as the CenturyLink . 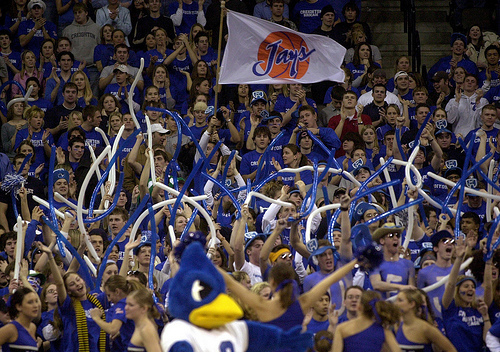 When Creighton students are loud and proud, our arena can be one of the hardest places to play in the country. As a coach and fan of the game, I know a home court advantage when I see one, and that is something the Birdcage can provide each home game. Your enthusiasm is infectious as the other 17,000 people in the stands will get crazy as they follow your lead!